LG has arrived with the best of innovation of the year at CES 2018 and this time, it is a new 4K UHD projector, the LG HU80KA. 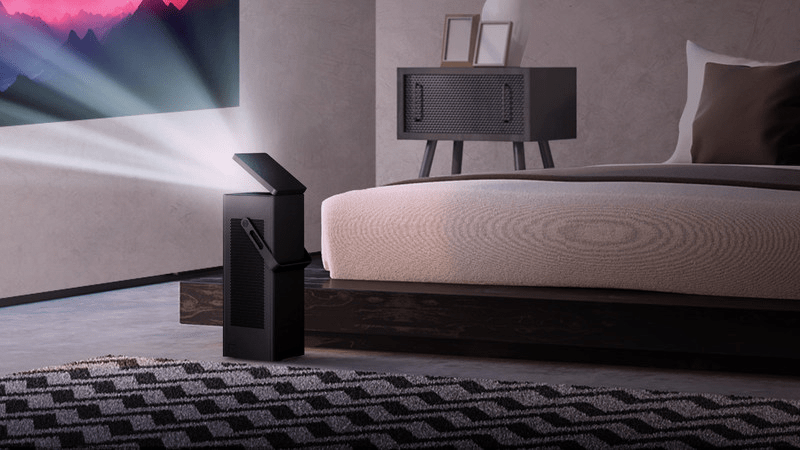 The new LG HU80KA projector is the world’s first 4K UHD projector which promises to deliver ultra-sharp video experience. Unlike the other projectors that offers 4K image experience and tend to be heavy, expensive and has difficulty in home installation, the new LG projector can be easily installed in home with same image quality of 4K resolution, thanks to LG’s amazing compact and beautiful design. LG has downsize its 4K UHD projector into a portable size which can create upto 150-inch screen with 2,500 lumens i.e. taking up the entire wall with image/video projections. The LG 4K UHD projector also supports HDR content and hereby, delivering an excellent cinematic experience for users in their home. This projector comes with a mirror reflector which is designed in such a way that it cover the lens and protect the projector from dust when kept aside. It can easily be handled and its Auto Cord feature ensures that user do not require it to mount in any room while using it. Connectivity support includes USB port, Ethernet port, HDMI port, along with wireless support for external devices like Keyboard and mouse. There are no news on pricing and availability yet, we will let you know once we get more updates on it. So, what are your views on this new 4K UHD projector? Leave your views in comments below stay tuned for more updates.